Assistant professor Zhihua Wang, doctoral student Jiyun Song, and master's students Jiachuan Yang and Tina Pourshams install a meteorology station on the roof of the Engineering Research Center. Zhihua Wang, assistant professor in the School of Sustainable Engineering and the Built Environment and co-director of climate systems research for the National Center of Excellence on SMART Innovations, is working to further the long-term sustainability of cities by studying the effects of rapid global urbanization on the natural environment and the changing climate. “Urban areas have a small footprint, but a big impact. They are like ‘hotspots’ on Earth” Wang says. Through field measurement and numerical modeling, his goal is to gain a better understanding of the transport and storage of energy within an urban environment and evaluate mitigation strategies to reduce the impact on temperature and reduce energy use. “Man-made materials have high heat storage capacity and buildings change wind patterns. Humans put heat into the environment and produce pollutants,” he explains. 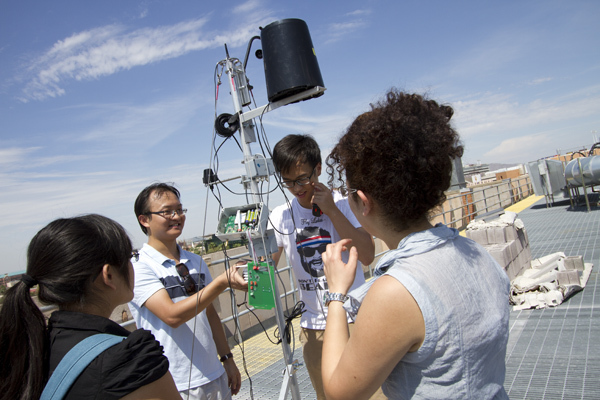 Wang has installed meteorology stations on the roof of the Engineering Research Center and at a lot that Tempe-based Creative Paving Solutions has provided for the experiment. Ultimately there will be 12 stations at varied levels and locations on campus and in the Phoenix metropolitan area. The meteorology stations provide real-time measurements of wind, temperatures, humidity, precipitation, solar radiation and soil moisture. At the off-site installation, Wang is also studying the effects of different surfaces—grass, asphalt and concrete—by measuring surface temperatures with an infrared camera. He is also planning to set up a flux tower on the roof of ERC building to perform eddy covariance measurement of turbulent fluxed arising from a larger source area. Wang’s interest in the field stems from a trip back to China. “Hangzhou is still a very beautiful place, but it was never as hot and humid as it is today,” he says. He says the Phoenix area is an ideal location to conduct his research. “There are a few large, compact urban areas like New York City, but Phoenix is much more representative of a new paradigm for urban development of future cities, not only in the US, but worldwide,” he says. Prior to joining ASU in 2012, Wang was a post-doctoral research associate in the Department of Civil and Environmental Engineering at Princeton University. Wang was recently appointed senior sustainability scientist in ASU’s Global Institute of Sustainability. Wang holds Ph.D. in environmental engineering and water research and an M.A. in materials, mechanics and structures from Princeton University. He holds M.Eng and B.Eng degrees in civil and environmental engineering from Nanyang Technological University. To see real-time monitoring on the ERC roof, visit: climaps.com/?comp=map&filter=612. For more information on Wang’s research, visit: www.public.asu.edu/~zwang159/.